I grew up in a small Czech community in Nebraska. I’m a hundred percent full blooded Czech on both sides of the fam. Growing up, we ate kolaches (Czech pastries) just about weekly, our holiday meals consisted of duck and sauerkraut and dumplings, every Sunday we listened to the Big Joe Polka show, and we attended Czech festivals throughout the fall months at every nearby community church. On special occasions the Czech singers would come to our church and play the accordion, and every wedding had at least one polka song to dance to. It seems the culture is slowly dying out in the area – there are less and less Czech singers every year, Big Joe is near retirement, and I haven’t eaten a kolache in years. 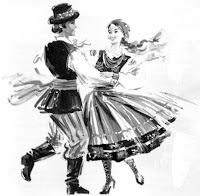 I especially enjoy the polka music and dance, and don’t want to give up that culture that makes up part of who I am. Host a culture festival: Wilber, Nebraska calls themselves the “Czech Capital of the USA”. The town gained notoriety for setting the world record for the biggest kolache. Every first weekend in August they have a huge Czech festival, bringing in tourism and lots of money to the town. Sponsor a pageant naming the Czech queen or king of your area. Well the other thing we should be doing is learning how to make kolaches! Once Mom is gone we're in trouble if we don't learn. For my part, I can barely fry an egg, but making kolaches is the one thing I plan to learn. Thanks for the reminder!